Welcome to the guest blogging series, So, You Want to Work in Publishing! The series features the personal stories of how young professionals broke into publishing. The guest bloggers and I hope that you find our stories encouraging, informative, and helpful in your own path to a publishing career. Where you currently work: Washington, D.C. It was well into my senior year at William and Mary–where I was graduating with degrees in Psychology and Anthropology–and I still had no clear career plan in mind. When my roommate asked me to go with her to a publishing seminar at the career center, I figured I’d tag along and see if there was free food (there was). Several of the seminar speakers had attended summer publishing programs, and the more I heard them talk about their experiences, the more interested I became. I had somehow never considered the field of publishing, but here were people telling me that I could channel my love of recreational reading into a viable career! I hustled back to my room to fill out some last-minute applications, and was accepted into the New York University Summer Publishing Institute. As one of the only non-English or Journalism majors in the program, I felt a little daunted. Many of my classmates already had impressive industry internships under their belts, whereas I had spent my summers employed as a camp counselor, and the school year working in the library’s Media Center. I knew that I didn’t have the traditional publishing background, but I was determined to make it work. I entered the program intending to take the editorial route–however, I had not anticipated the wide variety of other job opportunities SPI would expose me to. My interest slowly began to shift towards the more media-oriented side of things. I wanted to interact with the people who would be reading the books. With that in mind, marketing started to look better and better. This happens to be a fantastically exciting time for publishing – the increase in demand for e-books and the introduction of new digital technologies have opened the door to a whole new world of publishing possibilities. I began to realize that my computer skills – which I had worried would be of little use to me – might actually wind up working to my advantage. After the NYU program finished, I applied to a lot of jobs. I used job board sites like Bookjobs and Mediabistro, as well as city-specific sites like Book Builders of Boston and DC Jobs. I also signed up for email updates on job openings from some of the bigger publishers. I worked a few unpaid, part-time internships, while continuing to search for a paying position. This past spring I was hired to be the Marketing Assistant at Georgetown University Press. The main thing I got from the NYU program was a strong network of classmates. We have kept in touch and update each other on news and job openings. This has been an invaluable resource, particularly in an industry known for being quite insular. I also came to realize that having a unique background, built on a strong liberal arts foundation, has actually helped me to stand out from the crowd. I found my first post-NYU internship through a listing on Bookjobs. I worked remotely for a literary agency in New York (since I’d moved back to Virginia). My job was to read through the “slush inbox” and write up reader’s reports on submissions’ strengths and weaknesses. Then my supervisor and I would discuss via email and phone what made a project marketable. She also let me do some second-round editing on books already under contract, which I was always excited about. I learned a lot from that internship about foreseeing book trends and how to spot a manuscript that would sell. My typical day at Georgetown University Press involves entering sales data, updating the website’s content, and managing any issues that have arisen in the database. Because it is a small publisher, there is a lot of overlap in positions. I get to interact with the Marketing, Sales, Acquisitions, Editorial, and Production departments. Different seasons bring different projects, and every day presents some new and exciting challenge. I really enjoy being part of the process of bringing books and readers together. 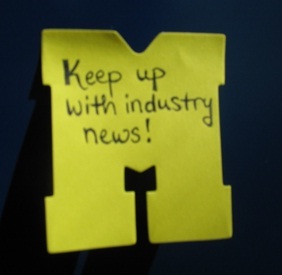 Keep up with industry news! Not only will your knowledge of publishing be appreciated in interview and networking situations, it may help you figure out what aspects of the field excite you the most. It’s always good to see a variety of industry information, and I like to explore sites like Shelf Awareness, Goodreads, Twitter, Tumblr, LinkedIn, Publishers Weekly, and blogs—like this one! Marketing departments are looking for people who are social media savvy, and who are willing to evaluate and implement new strategies. Knowing what the rest of the industry is doing is critical. You can connect with me on Twitter and LinkedIn (just shoot me a message and mention this blog). I am more than happy to answer any questions!